It has been an excellent week for Goffs at Punchestown so far with Grade 1 winning graduates each day and the success continued at last night’s boutique festival sale in which several lots achieved six figures and the top lot sold for €200,000. Lot 13 Getabird (pictured), a gelding by Getaway offered by Colin Bowe achieved an outstanding top price of €200,000 when selling to Harold Kirk and Willie Mullins. This attractive gelding demonstrated his potential when winning a competitive 4 year old maiden point-to-point last weekend. The second highest price of the evening was attained by Lot 4 Elegant Escape. This gelding by Dubai Destination showed huge promise when finishing only a length behind the Goffs UK Aintree sale topper, Samcro, on his only start. 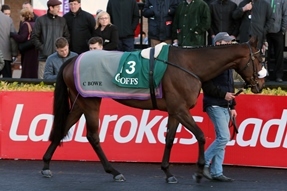 Elegant Escape was sold by Mr Christopher Donnelly and was purchased by John Romans and Colin Tizzard for €150,000. Harold Kirk and Willie Mullins struck again when purchasing Lot 17, the French bred Vent d’Automne, a gelding by the sire of Un De Sceaux Denham Red, for €100,000. Other significant purchases included sixth length winner My Story by Court Cave (Lot 11), offered by Donnchadh Doyle and selling to Roger Brookhouse for €90,000.